Emmanuel Church was built in Northwick Terrace in 1833/34 as a Chapel of Ease to Christ Church, Cosway Street. (It would later have been known as Emmanuel Parish Church). The building was paid for by the Hon James Henry Keith Stewart (son of 7th Earl of Galloway) and his relative Captain Frederick Malan at a cost of £10,624. Both were Evangelical churchmen. In 1876 it became Emmanuel Church and the Emmanuel Parish was created. The nearby Wharncliffe Gardens were built in 1897. In June 1923 the 7th Marylebone (Emmanuel) Girl Guides Company gave a display in aid of their camp and the Company funds in the Emmanuel Parish Hall Room in Aberdeen Place. 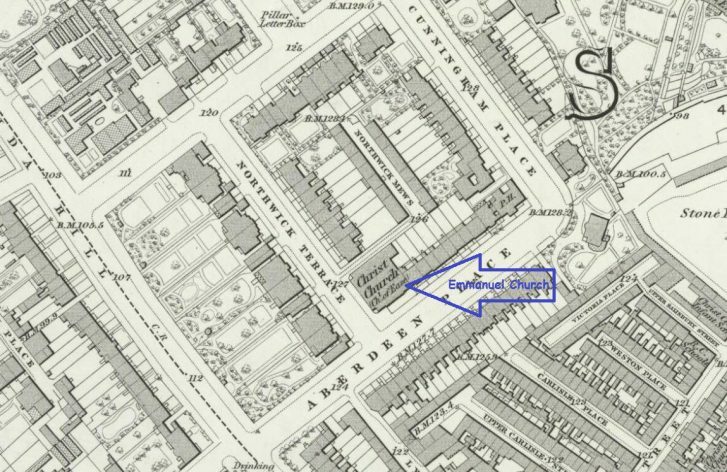 The Chairman was the vicar, the Rev J Vezay-Mason, MA and their Captain was Rosamund Bartley who lived at 20 (now 52) Hamilton Terrace. In 1931 the new curate at the Emmanuel was the Revd Guy Bullock who had been a British spy in WW1 before taking holy orders. He was also at one time British Consul in Switzerland. The new vicar’s plans for the restoration of Emmanuel Church included converting the galleries into 7 rooms for social activities – anticipating the eventual loss of the Parish Room, demolished in 1937 when the lease reverted to the Borough Council. October 1934 was the centenary of the building of Emmanuel Church. However 1936 was the end of a 33 year lease of the Parish Hall and Church School in Aberdeen Place when the Council decided to enlarge its electricity power station. In the 1870s there was a private school at 16 Northwick Terrace, run by Abraham Mendes from Jamaica. He was married with 8 children, and employed 2 assistant masters and 6 servants. There were 18 pupils, all boys, aged 9-18 and coming from as far afield as Jamaica, the Azores,Egypt, Portugal as well as from London. My mother (Marjorie Love) lived in Cedric Chambers during the 2nd world war. She was renting with her aunt, who both worked for the BBC at Portland Place and Langham House. They were ‘evacuated’ to Oxford for a time during the war. I’m not sure which number Mum lived at, but I remember her telling me they left the bathroom window open all day to allow their cat to come and go. How lovely being able to leave windows unsecure and open – different times. Wharnecliffe Gardens by J. Ronald Andrew.